Volunteering adds your effort to the work of others making lives better and building on the strength of our community. It also is a great opportunity for you to experience something new. What does volunteering for Pink Heals look like? 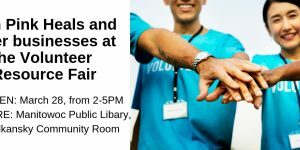 Want more information on volunteering? Click here to fill our Contact Us Form and we will provide more details! Or join us the first Thursday of each month at our Volunteer Meetings located at The Beacon (814 Washington Street, Manitowoc) at 6:30pm. 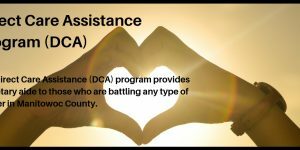 Don’t have time to volunteer, but still want to make a difference? You can donate today – just click here. Click here to complete and submit our Contact Us form. It takes less than a minute and we will reply within 48 hours. 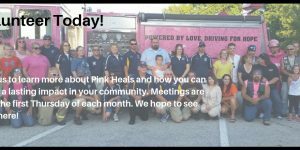 See how Pink Heals gets involved in our community on our Media Gallery page. View pictures, videos and so much more! Are you battling cancer and looking for answers. Our Resources page provides links to other websites with valuable information. Current volunteers - click the link to track your hours and sign up for events on Track It Forward.